This is a quick and easy vegetarian recipe for a basic vegetarian French onion soup with just a few simple ingredients. It's not a super fancy recipe, but it really doesn't need to be. If your cupboard is nearly bare and you're wondering what to make for dinner tonight, try this soup along with a side salad and an artisan bread and you'll have yourself a complete meal. Most French onion soup recipes rely on a strong beef broth, but using a strong and good quality vegetable stock will impart plenty of flavor. Any kind of vegetable broth will work just fine, but if you can find a vegetarian beef-substitute broth or vegetarian beef-flavored soup base, you may want to use that. For a vegan version, use a non-dairy soy cheese and vegan margarine (or even olive oil) instead of the butter. Need this recipe to be gluten-free as well as vegetarian or vegan? Just check the ingredients on your vegetable broth, as some are gluten-free and some are not. Or, make your own homemade vegetable broth if you want to be certain. Brown the onions in the butter or vegan margarine in a large soup pot, allowing to cook well for at least 10 minutes, and up to 20 minutes, stirring occasionally. After 10 to 20 minutes, you can add a little bit more butter or margarine and cook them for even longer, up to an additional 20 minutes if you have time, but you don't need to. Add vegetable broth, scraping the pot to get all the onion bits incorporated into the soup, then cover, and allow to simmer for at least 10 minutes. Season with a generous amount of salt and pepper, and add cheese, allowing it to melt slightly. Serve immediately. 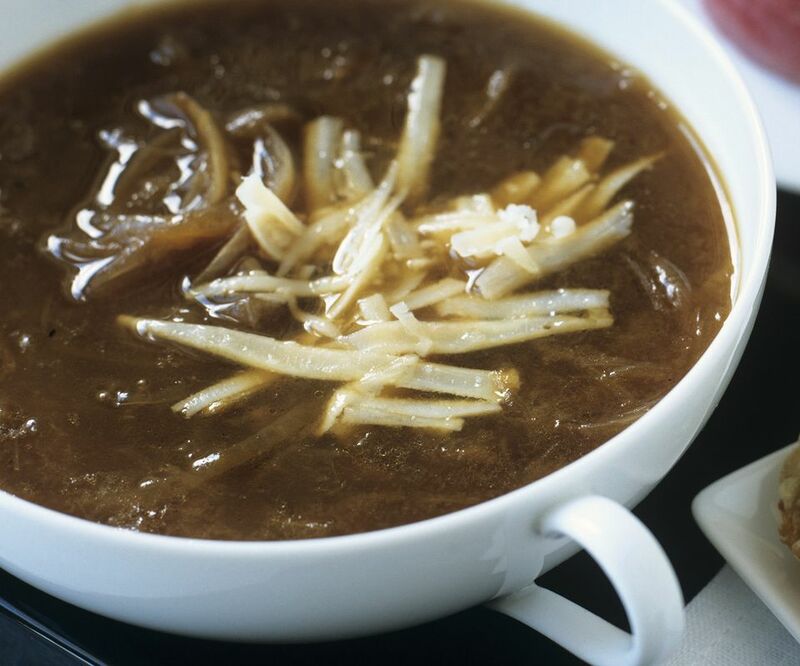 Serving tip: Traditionally, French onion soup is served in individual bowls with a sliced baguette on top, covered in cheese, and broiled in the oven for about 10 minutes.